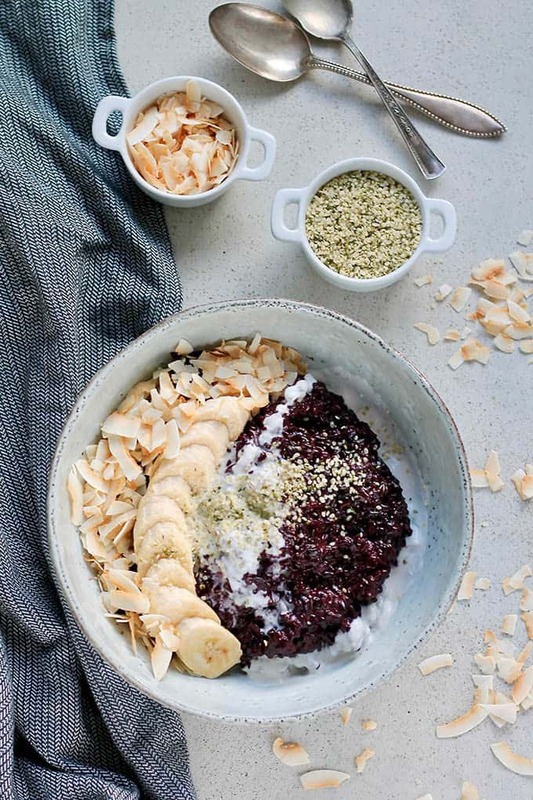 Indonesian Black Rice Pudding is a healthy vegan recipe that’s perfect for breakfast or dessert! Made with coconut milk and naturally sweetened with coconut sugar, this rice pudding recipe can be made on the stove top or in the Instant Pot. Back in 2014 when we were enjoying the carefree and frivolous life of a couple of DINKS, we spent the Christmas holidays in Bali. Of all of our tropical vacation adventures, I’d say Bali had some of the best food. It was one of the easiest places to eat as a vegetarian, I never got sick, and the flavours were outstanding. In between various stints on the beach, we spent a few days inland bopping around Ubud and surrounding areas. We drove scooters to look at the terraced rice fields, dodged monsoon rains, and ate a lot of really incredible food. Once a week the hotel we were staying at served Black Rice Pudding for breakfast. It was only served on Sundays and had to be ordered in advance, so I was happy that the stars aligned and I was able to taste this traditional Indonesian breakfast dish. 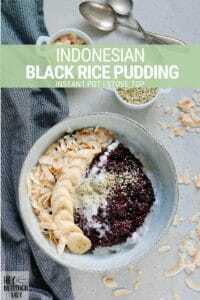 I love rice puddings of all manner, but Indonesian Black Rice Pudding is really something special. 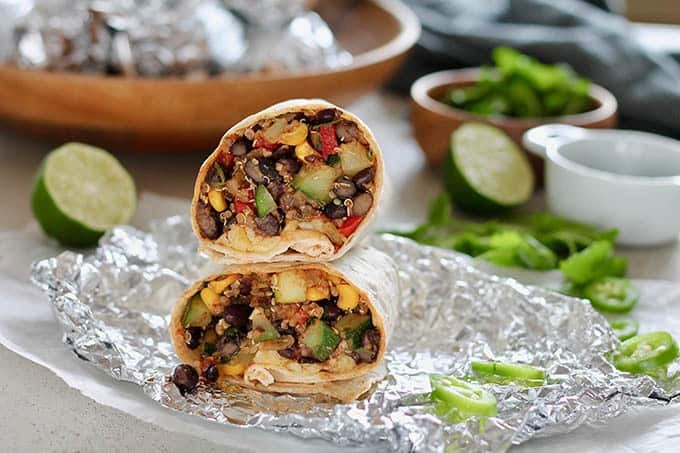 For starters, it’s completely vegan, and sweetened naturally with just a touch of coconut sugar. Drizzled with a touch of coconut cream and topped with fresh fruit and ooohhhhhmg, you’ve got to try this. 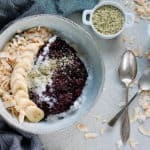 What do I need to make black rice pudding? Black Rice –> you knew that one was coming, right? Coconut milk –> don’t cheap out, we’re going full-fat here. 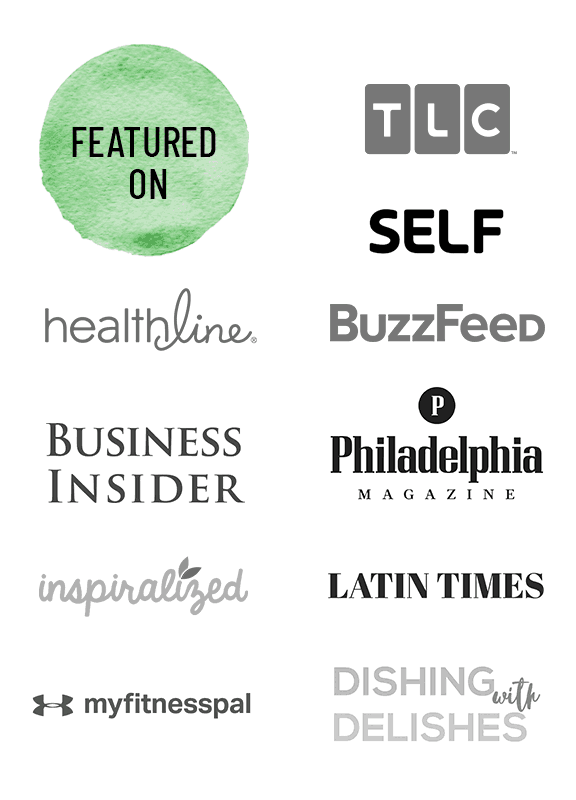 Coconut sugar –> we’ll talk alternate sweeteners below, I promise. 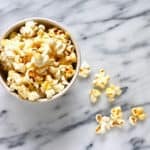 Can I make rice pudding in the instant pot? You can and you should. 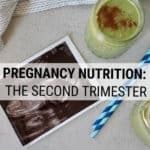 If you have an Instant Pot, that is. If you don’t, I got your back with stove-top instructions in the recipe card below. But know this: Instant Pot Rice Pudding is the bomb dot com. 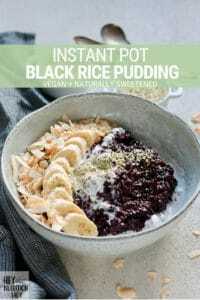 With a tougher whole grain like black rice, which normally requires pre-soaking or takes a ridiculously long time to cook, making rice pudding in the Instant Pot means it’ll be done sooooooo quickly. And your rice will be perfectly cooked, your rice pudding perfectly creamy, and your children perfectly behaved. Ok, I made that last one up. But you know what? Your children can’t eff with your rice pudding while it’s cooking in the Instant Pot, so go sit down and take some deep breaths or lock yourself in the bathroom with a glass of wine until you hear the thing beep. I’m not here to judge. Please note! These instructions are for making Indonesian Black Rice Pudding in the Instant Pot. If you’re making another kind of rice pudding or are using white rice, you will need to adjust the cooking times. Rinse the rice well and throw it into the instant pot with water, coconut milk, and coconut sugar. Secure the lid, then place on manual setting, high pressure, for 22 minutes. When the pressure cycle is finished, allow the pressure to release naturally for 10 minutes, then flip the switch to venting and quick-release the remaining steam. Give your rice pudding a good stir, and boom! You’re done! This is also super simple, it just requires more time. If you have the foresight to soak your black rice overnight, this will dramatically cut down on cooking time. If not (let’s be real, I never do) be prepared to simmer the rice pudding for around an hour. 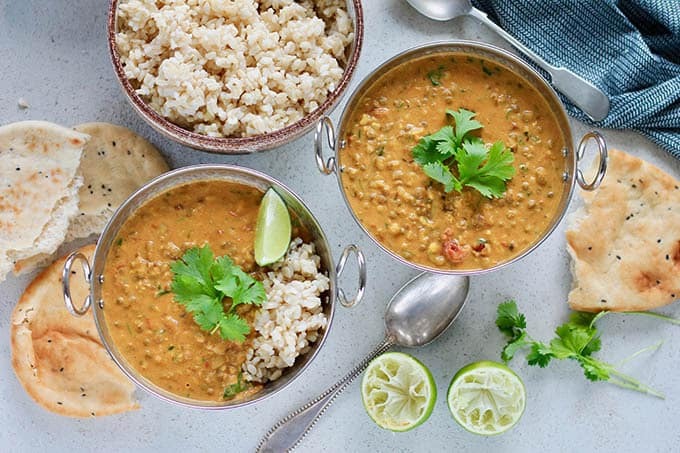 Simply combine water, coconut milk, and coconut sugar with the rice in a heavy-bottomed pot. Bring to a boil, then reduce to a simmer, cover, and simmer until the rice is tender. My rice pudding looks runny! Black rice pudding will thicken as it cools, so when the rice is tender if there’s a bit of liquid left, don’t worry, it’ll absorb. Can I use another kind of rice? I have only tested this recipe with black rice, and the cooking time and liquid ratios are specific to that. Can I use another kind of sweetener? Yes! 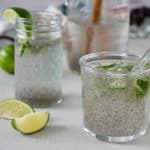 This recipe calls for 2 Tbsp of coconut sugar, but you can swap it out for regular sugar, maple syrup, or honey if you like. Should I serve this instant pot rice pudding warm or cold? I like it room temperature or on the cool side, but it’s a matter of personal preference. How long will this black rice pudding last in the fridge? It will last 3-4 days in the fridge. 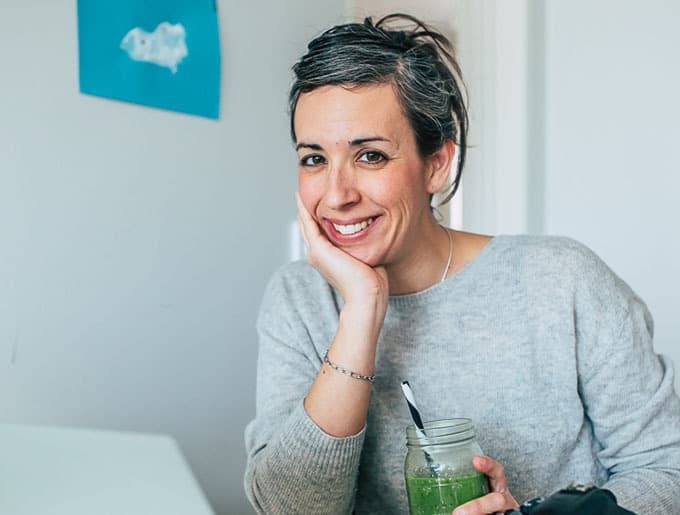 Hey Nutrition Lady, what’s the deal with black rice? I was hoping you’d ask! Black rice, also known as forbidden rice, is a type of sticky rice produced by heirloom plants in Indonesia, Thailand, and China. Legend has it that during the Ming Dynasty in China only the emperors were allowed to eat black rice, hence the name forbidden rice. The black colour (actually a deep dark purple) provides a powerful punch of antioxidants from anthocyanins, the same antioxidants as are found in blueberries and other purple foods. These fight inflammation, free radicals, and are thought to improve cardiovascular and brain function. Black rice is a rich source of zinc, copper, and iron, and is a significant source of dietary fiber. 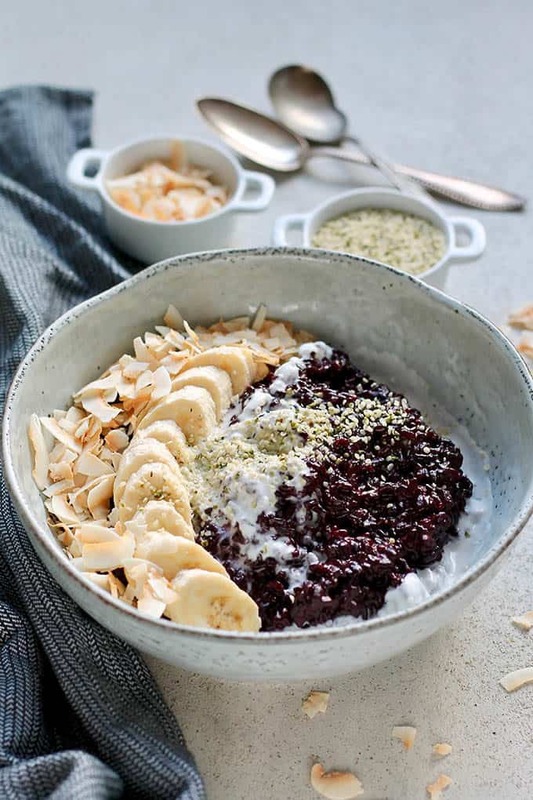 Indonesian Black Rice Pudding is a healthy vegan recipe that's perfect for breakfast or dessert! Made with coconut milk and naturally sweetened with coconut sugar, this rice pudding recipe can be made on the stove top or in the Instant Pot. In a medium-sized pot, combine the black rice, coconut milk (reserve a couple of Tbsp for drizzling if you like) salt, and 1 1/2 cups water. Bring to a boil, then reduce the temperature to low and simmer covered until the rice is tender and most of the liquid has been absorbed (you still want a little liquid as the pudding will continue to thicken as it cools). This will take about an hour, so be sure to give it a good stir every once in a while and check on the cooking progress. Once the rice is cooked, remove from the heat, then stir in one Tbsp of your chosen sweetener, and taste. You may or may not want to add another. 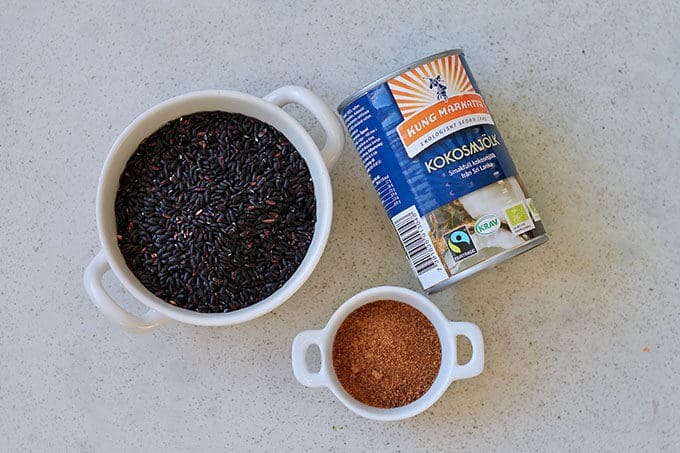 Combine black rice, coconut milk, coconut sugar, and 1 cup of water in the Instant Pot. Seal the Instant Pot, and set to Manual --> High pressure for 22 minutes. When the pressure cooking cycle has finished, allow the steam to release naturally for 10 minutes, then flip to quick release the rest of the steam. Tip! I like to do this under my stove fan if possible. If not, throw a kitchen towel over the top to control the steam. Remove the lid and give the rice pudding a good stir. 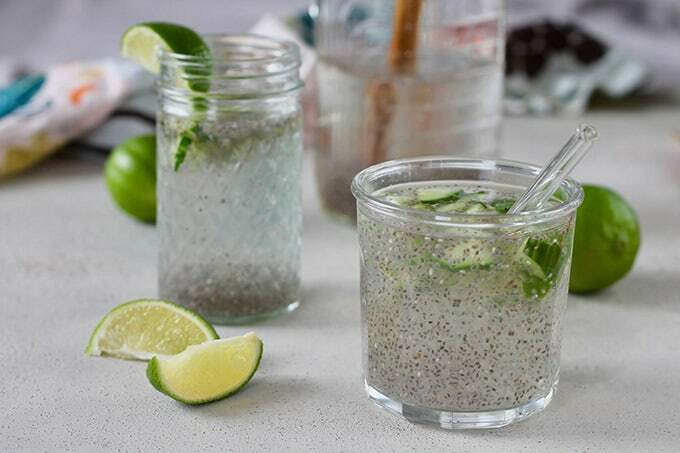 Serve hot, warm, or cold (my favourite) drizzled with a bit of extra coconut milk, and garnished with diced banana and a sprinkle of hemp hearts. Nutrition values are an estimate only. Black rice pudding will thicken as it cools, so when the rice is tender if there's a bit of liquid left, don't worry, it'll absorb. Rice pudding will last 3-4 days in the fridge. 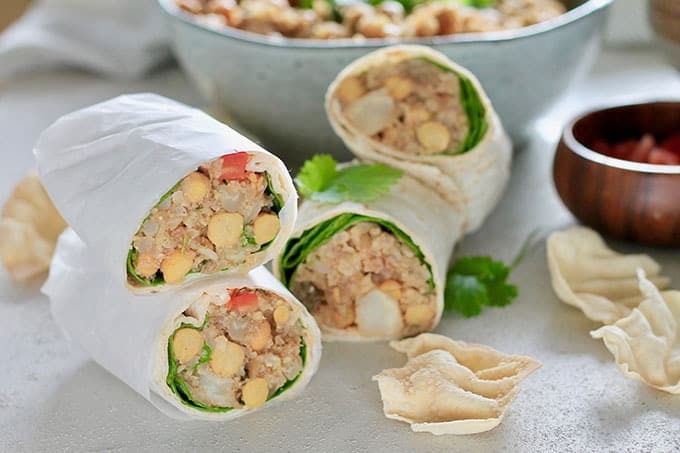 This recipe was originally published February 26, 2015. 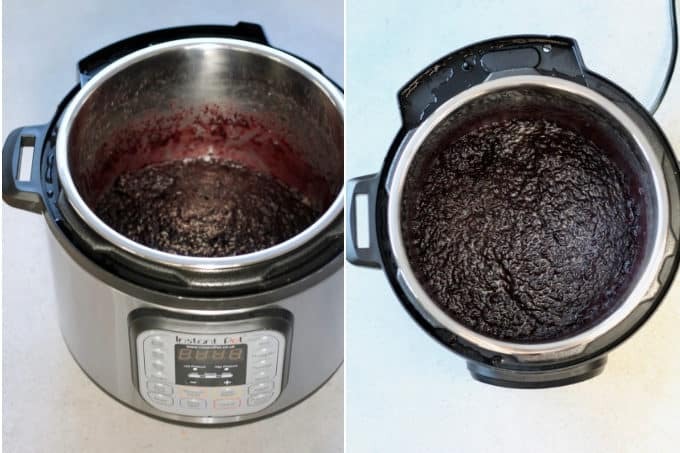 It was retested, rephotographed, and updated to include Instant Pot instructions on January 21, 2019. I spent about a half of a day chasing a bat out of my house a few years ago. I don’t know how it got in, but it was absolutely nerve wracking, so I totally feel your pain! Glad you at least got some good breakfast inspiration out of the experience. Sounds delicious. 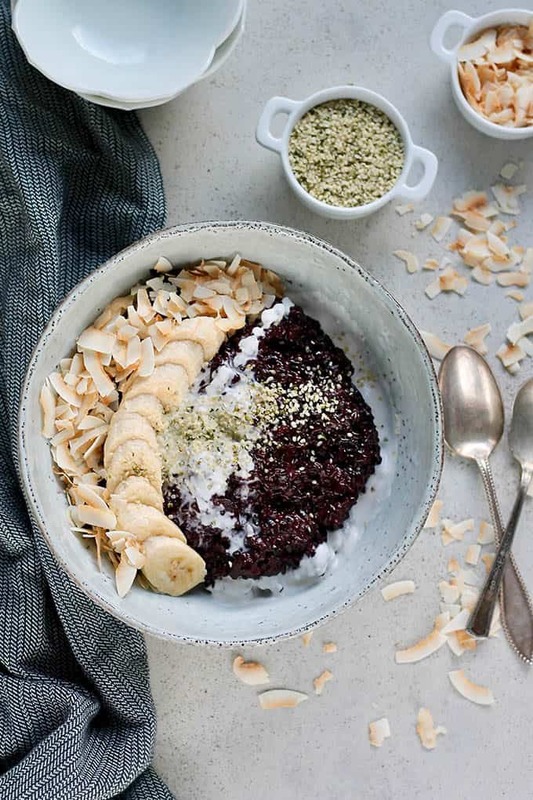 I’ve been wanting to try some new recipes with black rice, and I love anything with coconut milk, so I’ll give this a try soon. We did figure out how the bat got in – turns out the husband had opened the bathroom window before we went for dinner, and neither of us realized it was still open when we went to bed. Let me know how this turns out for you, Alissa! This looks great, thanks for sharing! I have a bag of black Japonica rice, is that the same as the black rice that you used? I did some googling to find out and apparently it’s not the same, but I’m sure it would work out just fine in this recipe. Try it out! You actually caught that bat!!! I would have been screaming so loud that the hotel security would have broken down the door to see what the problem was, and then they would have caught it! You are my hero. Okay, this rice pudding sounds incredible. I have all of the ingredients in my pantry, including palm sugar. I’m going to make some today so that my husband and I can have it for breakfast tomorrow. Thanks for the inspiration Katie! Oh we were screaming! I’m sure the neighbours thought there was a murder scene happening in there, but this was a Bali guest house and the main hotel was down the street. We eventually caught the (exhausted and terrified) bat when it landed on the mosquito net again and the husband whacked it hard with his pillow. The bat fell down and was lying on it’s back panting like crazy when I threw the sarong over of it. But the poor little guy did fly away after we tossed it over the balcony, so no bats were hurt in this operation! I hope you love this pudding as much as I do! My mouth is watering already. When I read about your smoky sugar I was ready to hop on a plane and come to your house…stalking may occur 😉 YUM! Well if you’re going to hop on a plane I’d suggest you head to Indonesia and pick up some palm sugar of your own. Much warmer than here in Sweden! Yum! I have everything but the palm sugar, will use coconut sugar. This sounds amazing for breakfast. Coconut sugar would also be great in here. Let me know how you like it! I think coconut sugar and palm sugar are the same thing: coconut palm sugar. They’re actually from two completely different types of trees. Very similar in texture, but a very different taste. I think that Ubud was a much quieter place before the popularity of Eat, Pray, Love. It’s influence was clear there, in the type of tourist that was in Ubud as compared to other parts of Bali, and Ubud has become very commercial. There’s a Starbucks on the main drag, for Pete’s sake! I felt that we visited Ubud probably 5-10 years too late. That’s really good insight! Your response reminds me of something I heard on public radio recently. I listened to a seasoned traveler speak about the fact that guidebooks can ruin the great spots in a particular city by generating more traffic than the location may be able to accommodate / making the area much more touristy than the cultural gem it was prior to the exposure. I made your rice pudding recipe tonight to reheat for breakfast tomorrow. It was delicious, and I can’t wait for breakfast! Yeah, that makes sense. I’ve read that Rick Steves and the railway have ruined the Cinque Terre in Italy, and I don’t know what it was like there before his influence and before the railway meant easy access to those towns, but it sure is touristy now! Of course, Ubud and the Cinque Terre are both places I’ve been to, so I suppose I’m part of the problem! Glad you enjoyed the rice pudding. It’s one of my favourites, though I must say I prefer it cold! I totally get what both of you are saying, and Ubud is definitely commercialized. However, with globalization there are so few places that exist untouched by the world. And frankly there is so much we can learn by traveling (even if people have been there before us). I still had an incredible journey in Bali, and would definitely go back and try getting to the western side! Balinese food is probably up there in my favorite cuisine! I cannot wait to make this pudding at home, because it was definitely a highlight! I had a great time in Bali! Would love to go back and explore other parts. I found the pollution (plastic washed up all over the beach) in Seminyak particularly sad, but I agree there is much to learn from traveling and I always love exploring new places. 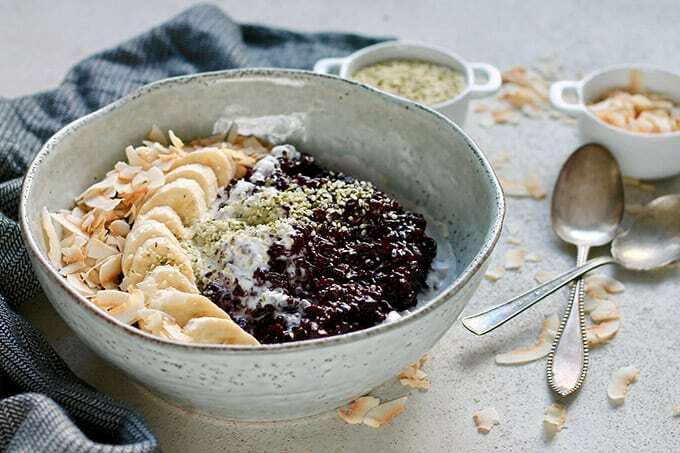 I hope you love this black rice pudding as much as I do! Thanks for the recipe. I was there in the early 90s and Ubud was a beautiful place…a town of Balinese artists and artisans. Very quite. No traffic. I’d hate to see it now. It sounds too upmarket for me. What a shame. I first went to Ubud 30 years ago. There was Murni’s Warong a few shops and little else. It has become increasingly popular year. by year. I don’t think the book ruined it but it pointed it a little more in the direction it was already going. Stay outside of town and come in for the restaurant or shopping if you must but it’s a great place to base yourself and so so much better than the south. 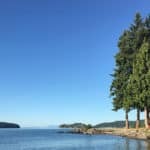 There are great day trips activities like am amazing bike ride and elephant sanctuary just stay out of town when you aren’t a one of the amazing restaurant s. Renting a house is fab. Great recipe. Will def try. I remember Murni’s, best satay ever. We were there for the last King of Ubud’s funeral, 1976 I think. Well before the tourists got there. Sadly Bali is a place I wouldn’t bother visiting now. Full of drunk Aussie bogans (I am Australian before anyone gets rattled but acknowledge we are amoung the top 5 worst tourists in the world) though out of town gets you away from them. It is sad too that so many Javanese have moved in, culturally that is. Oh gosh Katie, that does sound pretty traumatic! At least this was probably offset by such good food at the hotel (which sounds lovely), including the black rice pudding. I do have palm sugar, which I have to chip away at to use: it’s SO hard, isn’t it? I am bookmarking this for the next southeast Asian meal I make for friends. It will be dessert rather than breakfast. I don’t tend to have many breakfast parties! This palm sugar is powdery, with a very similar texture to coconut palm sugar or sucanat. I wonder if it’s been made differently from the palm sugar you have – is it more like jaggery? But yes! Do make this dish. It’d be a fabulous dessert as well. Thanks Anu! It’s such a lush and delicious breakfast or dessert. Thanks for sharing, i love it!!! Ahhh Bubur Pulut Hitam. I loved this the first time I tried it and it happened to be a in restaurant not far from Ubud. However I’m suprised you haven’t mentioned pandan leaves in the recipe. They can be difficult to source but they are what give the dish such a unique taste. 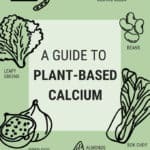 This is the first recipe I’ve seen that hasn’t included them.